How do I Price my Handmade Jewelry? For more jewelry business articles, please visit my new website Handmade Results  Get Results Selling Your Handmade Jewelry. The eternal question for jewelry artists: How do I price my handmade jewelry? Pricing handmade jewelry is one topic that jewelry artists never agree on. There are lots of different viewpoints and philosophies. Keep in mind that you do much more than make jewelry as a business owner. In order to cover costs and overhead it is essential to charge more than your hourly rate + material costs, or keep your hourly rate on the high side (i.e. $18/ hour is much more realistic than $10/ hour) if you want your business to be profitable. One mistake that new jewelry designers often make is to price their work too low. Don’t compete with imports on pricing! Your quality is better, and you can never compete with those that make $2 a day. Instead, position yourself as the high quality artisan that you are, and command reasonable prices. As a newcomer, you can start lower if you would like, and move your pricing up as you become more well-known. Lower pricing also can work against you because it cheapens the perceived value of your work. People tend to think that you get what you pay for, so if you charge too low, people tend to think you make garbage. If you charge too low, you are not only cheapening the perceived value of your own work, you are also cheapening the work of others because the public learns to think that some artisans who charge what they are worth, are charging too much. Those artisans that charge what they are worth then have to work so much harder to convince customers that their work is worth the cost. That said, as a jewelry designer, you need to consider two types of pricing: wholesale and retail. Still confused? A little worried about pricing too high? Why not try using the internet to find out what the market thinks? Try a survey. Why not ask? If you create a survey and ask people nicely to fill it out, they often will. Sweeten the deal with contest draw for a piece of your jewelry. How do you do this? You could ask a blogger with a busy blog visited by your target market to feature your contest- and maybe give them some useful content for their blog. Make the contest fun in some way for best results. Ask at forums. You could ask for feedback from people at a shopping forum or other niche forum (related to your target market of course!) 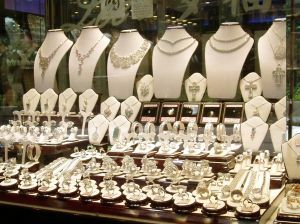 to take look at your jewelry and ask them how much they think people would pay. This well-written, easy to understand book is a great starting point for anyone just starting out, or considering whether or not they should start to sell their own jewelry.